‘apply knowledge and understanding to interpret, analyse and evaluate geographical information and issues and to make judgements’. My Year 10 students have been developing their AO3 skills but many have struggled to include everything required in their exam answers. In an end of topic assessment where they were asked a question on rural to urban migration, many of them interpreted the figures provided correctly but forgot to write a balanced evaluation, whilst others forgot to include the figures but wrote a balanced evaluation. This meant that a fair number were restricted to the lower bands of the mark scheme. As part of a feedback session, we spent time as a class deconstructing the exam question and this helped many students to realise what the examiner was looking for. There are two different ways that I have tried, one is BUG (box the command word, underline the key words and go back to the question) and the other is KFC (knowledge, focus, command word). It was clear that a large number of students did not yet know the command words, so this will be revisited regularly. Once they had deconstructed the question, we created a basic AO3 plan as a class – a clear structure of three paragraphs (for/against/overall opinion) which would help them to fully meet the examiner’s criteria. They then wrote a new answer to the question using the sheet on the left. I found that my students were eager to improve their marks and pestered me to mark them as soon as possible! For homework, the students then completed a different AO3 question – on informal settlement issues in global cities – using the skills that they had acquired in the feedback lesson. 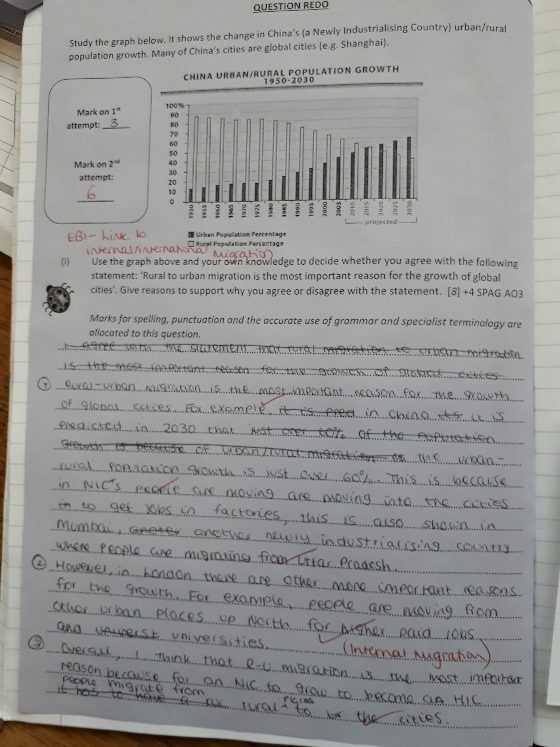 The majority of students focused on one way to improve their answers (e.g. linking to their knowledge of global cities), which improved their mark but still left them stuck in a lower band. 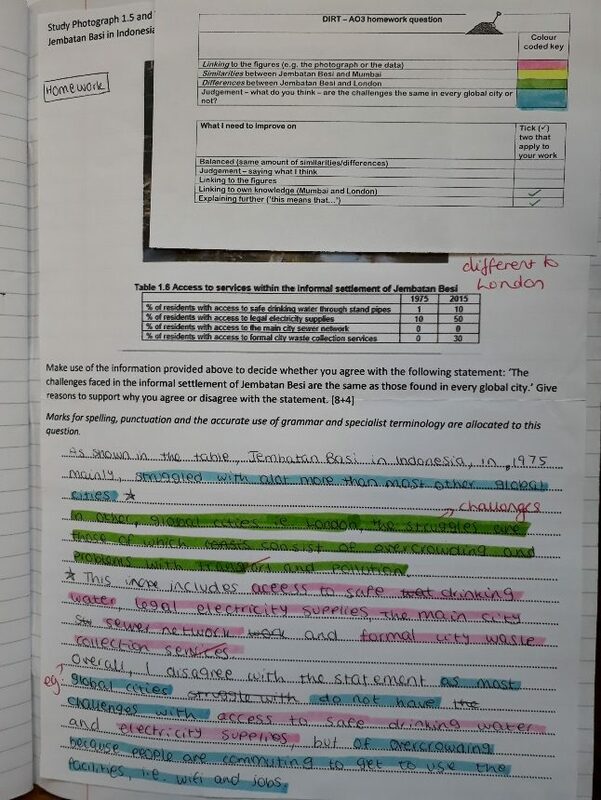 During DIRT (directed improvement and reflection time) the students highlighted their work using a prepared answer guideline sheet (on the right). This meant that they could recognise what they needed to improve. The visual nature of the task allowed students to pick out what they had/had not done, with many highlighting large sections about Mumbai and a line about London. The criteria included in the DIRT sheet is taken from the sample assessment mark scheme. When they next complete an AO3 style question, I will remind the students of this feedback so that they can improve again. If you have any ideas that you have been using with your students I would be very interested to hear! Rachel Hawke is currently teaching geography at George Abbott School in Guildford. She completed her PGCE at the University of Oxford, during which time she developed an interest in enquiry learning. Her ideas on this subject have since been published in the ‘Teaching Geography’ journal.